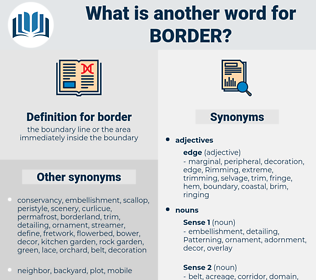 What is another word for border? settlements, centres, Movements, circles, Rifles, points, Les, boarder, goods, edge, edges. items, Les, boarder, Bordure, edge. frontier, borderland, border-crossing, threshold, delimitation. core, center, inside, interior, middle, inner, within, heart. let go, loose, free, lose, be inside, release. Even Tom Robinson could not have been nearer when he was more than half way across the border - land. The little party set out towards the border, and before long met numbers of fugitives, weeping women carrying children, old men and boys, making their way from the neighbourhood of the Danes. circumference, fence line, circuit, property line, state line, state boundary. close in, hem in, enclose, girdle, shut in, fringe, inclose, gird, cloister.